The latest and potentially final season of "The Ultimate Fighter" debuts in August and the cast list of heavyweights and women's featherweights has been revealed. The newest season of “The Ultimate Fighter” is set to debut on Aug. 29 on FS1 and the cast last has been revealed. The latest installment of the long running reality show, which may be the last with the UFC moving to ESPN in 2019, will feature middleweight champion Robert Whittaker and former “Ultimate Fighter” winner Kelvin Gastelum as coaches. 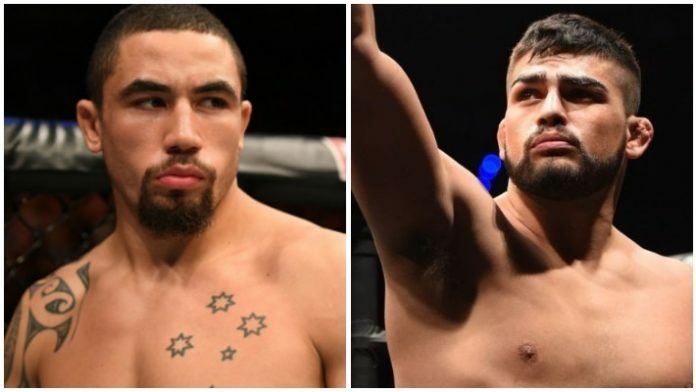 Following the season, Whittaker will face Gastelum in a title fight at an event still to be determined in late 2018. As for the cast list, the women’s featherweight division will take center stage for the first time ever as part of “The Ultimate Fighter” next season. The 145-pound women’s division was first introduced last year and now the weight class will be featured on the reality show. As for the heavyweights, that cast list includes at least one familiar face as Josh Parisian returns after earning his spot on the show after winning a fight on Dana White’s Tuesday Night Contender Series two weeks ago. Parisian was a late replacement and originally expected to be an alternate on “The Ultimate Fighter” but now he’s earned a slot on the roster. The new season of “The Ultimate Fighter” dubbed “Heavy Hitters” will debut on Aug. 29 on FS1 with the live finale taking place in Las Vegas on Nov. 30.